Prime Time Sports Talk | NBA Power Rankings: Is It Finally Denver, Milwaukee’s Time? NBA Power Rankings: Is It Finally Denver, Milwaukee’s Time? After a week off, Prime Time Sports Talk’s NBA Power Rankings have returned! No surprise, the Warriors remain at the top. The Raptors, Nuggets, and Bucks have continued their strong start, while the Thunder and Rockets have slowly begun to round into form. Meanwhile out west, the Jazz and Lakers continue their free falls down the ranks. Without further ado, here we go with this week’s edition of the rankings. The Warriors remain atop the league, and why wouldn’t they? Klay Thompson, Steph Curry, and Kevin Durant are just messing with the league right now, the latest example being Thompson’s 50 points in 26 minutes, and he only touched the ball for a whopping 96 seconds. Until further notice, can we just permanently lock this in? The Raptors are having a phenomenal season, but because it’s Toronto, no one will talk about it. Kawhi Leonard has been sat for multiple games this year because of rest, yet the Toronto train hasn’t stopped rolling. This version of the Raptors is even better than the 59 win one seed from last year so it will be a dogfight at the top of the East down the stretch. This seems to finally be the Nuggets year. After years of prognostications that they will finally break through, this is it. They are still undefeated at home and beat powerhouses like the Warriors and the Celtics. In their most recent victory, a 115-107 come from behind affair against Boston, Jamal Murray went off for a career-high 48 points. If this production gets combined with Nikola Jokic and Paul Millsap at full potential, this club will be downright lethal and a force to be reckoned with in the loaded West. The Bucks are still rolling after their first loss of the season at the hands of the Celtics. Mike Budenholzer seems to be the move the Bucks so desperately needed in order to get their offense clicking with Giannis and Khris Middleton. A lack of outside shooting might eventually doom the Bucks, but for now, Donte DiVincenzo has been lighting it up along with Middleton. Is this finally the Bucks’ breakthrough year? The Celtics have been off to a decidedly underwhelming start to the season. The offense has yet to fully click for a full game, and although the afro-less Kyrie Irving woke up and started to score in bunches, the Celtics continue to struggle. 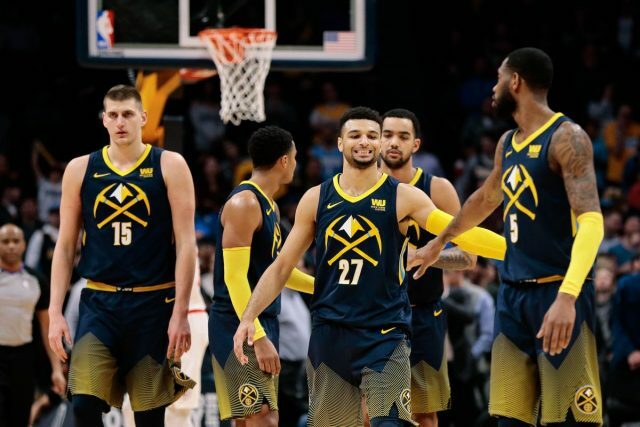 Their defense has gotten them through some games, but two tough losses to the Pacers and Nuggets loom large. The Celtics need to find their offensive game plan in the coming weeks or they will be farther and farther behind the Bucks and Raptors. The Blazers already beat the Lakers twice so far in this young season, and the death of the late Paul Allen has seemingly galvanized this Blazers team. Nik Stauskas emerged as a great role player off the bench, and their next challenge is the Bucks tonight. This will be a real test to see if the Blazers are who they claim to be, as they chase their second straight top-three finish in the West. The Spurs are once again quietly having a good year. Despite a bad loss to the Magic, Gregg Popovich and company will always be around come May and June—they are simply too talented and too well-coached not to be there when the dust settles. Working in Jakob Poeltl continues to be a struggle, but the Spurs will make it work like the Patriots do—next man up, do your job, etc. The Pacers are a gutsy, scrappy team that always play each team down to the wire. Saturday night in Boston, it was the Victor Oladipo show in the fourth quarter. Their real measuring stick will be tomorrow against the 76ers, but so far Tyreke Evans looks like a fit and with Oladipo and Domantas Sabonis continuing to develop, Indiana continues to improve following their seven-game exit at the hands of LeBron James last year. The Sixers look like the odd team out in the East. The Bucks, Celtics, and Raptors all look like clear-cut better teams, and the Pacers might be on their way to add to that group soon. The Sixers were linked to everyone and their cousin the offseason, but the lack of new acquisitions loom large combined with the losses of Ersan Ilyasova and Marco Belinelli. It’s time for the Sixers to stop trusting the process, and trade some of those treasured draft picks for someone that can help poor Joel Embiid because we all know Ben Simmons can’t shoot a lick. The Thunder round out our top 10 mostly because of their resurgence after an abysmal 0-4 start. Granted those wins came against teams like the Wizards and Suns, but Oklahoma City is getting it done when it has to. They can also thank their lucky stars because Russell Westbrook’s ankle injury isn’t believed to be serious. The Thunder are probably heading for another early playoff exit, but they need Westbrook to even make it that far.